This past month has been busy! 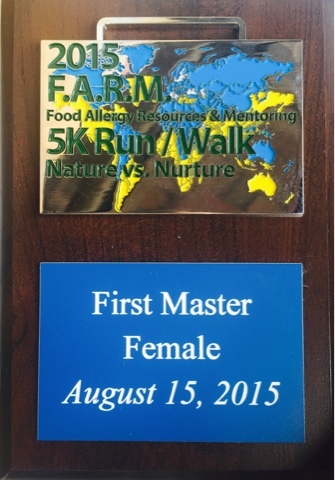 Our organization, Food Allergy Resources & Mentoring (FARM),had its 2015 5K themed "Nature vs. Nurture". After months of advocating for food allergies and the need for community awareness, then getting sponsorships from local businesses, the 5K happened! This year's was so amazing because the community really embraced our cause, and I really felt progress in our mission being made. The event was truly an experience from start to finish. The theme "Nature vs. Nurture" wasn't without cause. Our venue was at the Ritch Grissam Memorial Wetlands, a wildlife photographers haven. The off-road course was laid out among all of Florida's native wildlife, and Yes that meant alligators too. 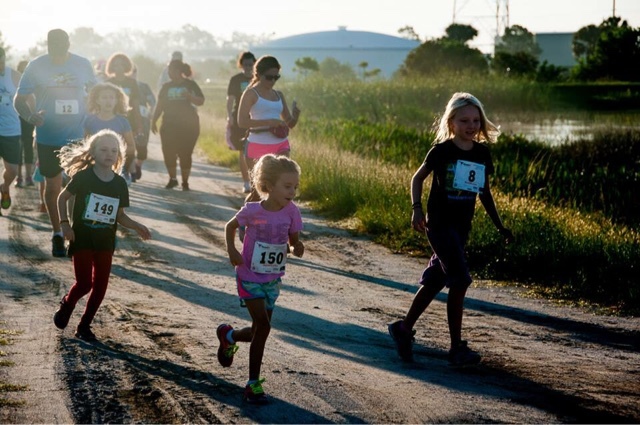 With a heightened sense of their surroundings, the race participants learned some eye opening food allergy statistics from posters held at each turn by our amazing volunteers. 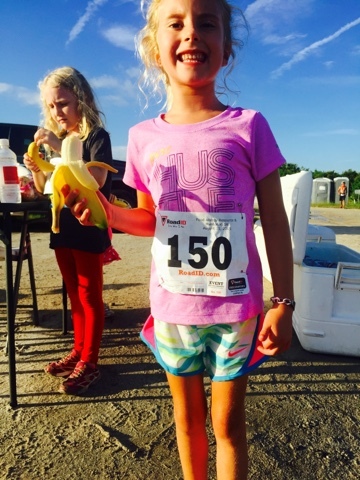 It was impossible to finish the race without a newfound understanding of food allergies. 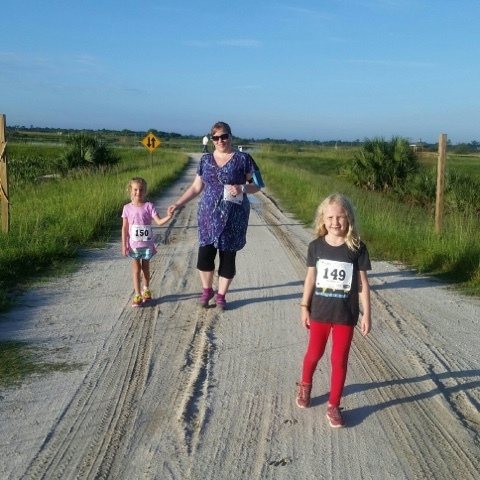 I would even go so far to say that the runners even experienced a sense of the feeling of living with a life threatening food allergy for the 3.1 miles. The chronic need to be aware of your surroundings intertwined with a sense of constant fear to be exact. The last bend had a pretty good sized alligator harmlessly basking in the sun--which helped a few runners speed up their race time! As the participants ran through the officially-timed finish line there was more to come. An epi training table offered the ability to touch and learn how to administer a life saving epinephrine device. Our own food allergy ambassador, Sophia, was happy to demonstrate. A wonderful local health food store, Paradise Health, had goody bags full of special treats all free of the top 8 allergens. Our local hospital Health-First, recently awarded a 5-star status, title sponsored the event. They've really gotten on board with our food allergy advocacy efforts in our community! We had 12 very willing sponsors this year. It seemed so much easier than last year to get people to understand FARM's cause, mission, and the desperate need for community awareness and food allergy safety education. The immediate embrace we felt from the community was a great reassurance that our efforts are making a difference in the world. I met another "food allergy family" there that became one of my HelloMama's friend on the spot! 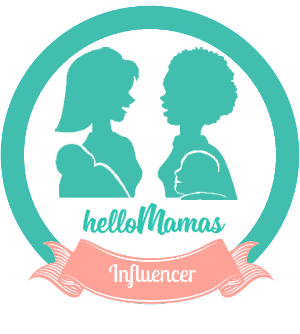 It's so easy to join HelloMamas and I'm working hard to grow a food allergy mom group here locally. It's been such a busy, productive month and I really feel like progress is being made. Perfect stranger's can connect so deeply over major life obstacles. Becoming a "food allergy mom" is a scary roller coaster that I really "get". Although My identity has morphed into that one role of my life, I know the tools I have to identify with others has come from many mountains I've climbed in the last. We are all a product of our pasts. I have had a pretty unconventional life filled with a lot of obstacles to overcome. I always try to overcome things before they can overcome me. I'm an internal fighter- if that's even a word. I've been or felt alone throughout so many points of my life, but I have always found my way through the really hard things, because at some point in my life I became my own best friend. adjustment and reality of the role of "food allergy mom", because it's hard and it's needed. I didn't find that resource myself and so I know personally that there's a real need. There really aren't a lot of resources and we need to count on each other. Trust is the hardest part of this role. Sometimes trusting others can only come when you can see how human and flawed they really are. Something that most people don't know about me is that after I became a mom and subsequently a "food allergy mom", I had a REALLY difficult time. I had major complications after my first-born's birth. I developed a serious scarring syndrome and eventually developed painful lysis of adhesions. I had a very late miscarriage, which is something I never talk about because I can't bring my mind to that place for more than a few minutes. When I lost the baby I took it so hard, I was devastated beyond words. During this same time-frame, I was learning how serious my daughters food allergy was. We became excluded and isolated from family when we needed them the most. I had more miscarriages and one more baby to come on my journey into figuring out this role as a "food allergy mom". My oldest daughters food allergy became so severe that we flew to NYC to see the #1 allergist in the country to make sure I had all of the information I needed to keep my daughter safe. On that trip the Doctor did an extensive new test that showed her milk allergy was anaphylactic! I left NYC more scared, knowing how quickly it could take for me to lose her forever if someone exposed her in any way to milk. I also learned that I had lost another baby to miscarriage. My entire experience as a mother has been a life of chronic avoidance and fear of anaphylactic shock, and the reality and the closeness to death through miscarriages I've felt and understood. I never wanted to feel that loss of a child again, I just couldn't. I could focus on the struggles of managing a life threatening food allergy, or of the moments I can't even speak of still when I've learned my growing belly and baby inside had died. But, I can't. That isn't my purpose and I'm not going to focus on what I had no control over. I'm going to spend my life truly appreciating every moment I have with the two miracle I was given, when God gave me two healthy baby girls. My husband and I started our non-profit Food Allergy Resources & Mentoring to help grow awareness of food allergies. To make the world a safer place to be with food allergies. To show our daughters that we have the power to make a difference in the world, even if alone it's just a small one. To give them a childhood of memories of working as a family unit to help others. And, especially, to show my girls that Mommy and Daddy would do anything for them and their needs, and that we support them in attaining all of their dreams. So, my very personal attachment and understanding of loss has lead me to here. To right now and trying to help give a voice to the needs of all kids with food allergies, (including mine) because every day I live as a mother I am so thankful. When I see FARM flourishing and growing in a positive direction, it fills my heart with hope. This year's race did that for me and I have nothing but gratitude to all that supported the growing food allergy epidemic that sends a child to the ER every 6 minutes.